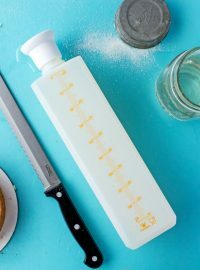 Do you know Mike over at SemiSweet? He’s a great decorator, designer, and an all-around good guy. In case you didn’t know he has a cookie cutter shop with cutters he’s designed. They’re amazing! I like all the cutters he’s made and I wish I could buy each and every one of them. 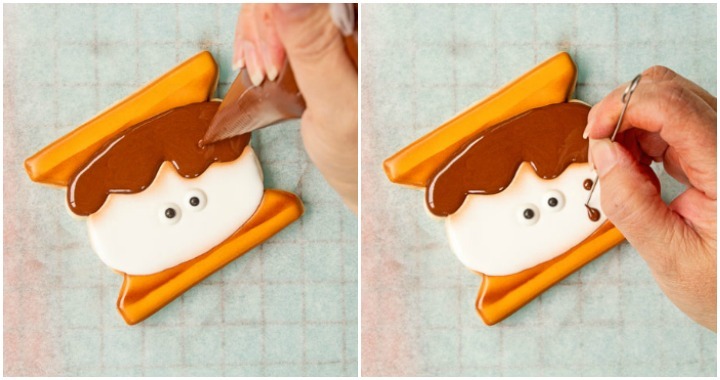 Unfortunately, I don’t have Ritchy Rich’s money so today we are going to talk about his S’more Cookie Cutter. He made a s’mores cookie cutter and I fell in love with it. I couldn’t wait to decorate it because after all, isn’t summertime full of fun? 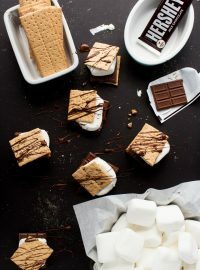 What’s more fun than making s’mores over an open fire? Its one of those things that I enjoy about summer. Hearing the crackle of the fire and watching the warm colors appear from the firewood makes a perfect night, especially when there’s chocolate involved. You need to go check out the tutorial Mike made on How to Make Decorated S’mores Cookies. If you like the cutter, buy it. Life’s short so let’s have a campfire and some s’mores! 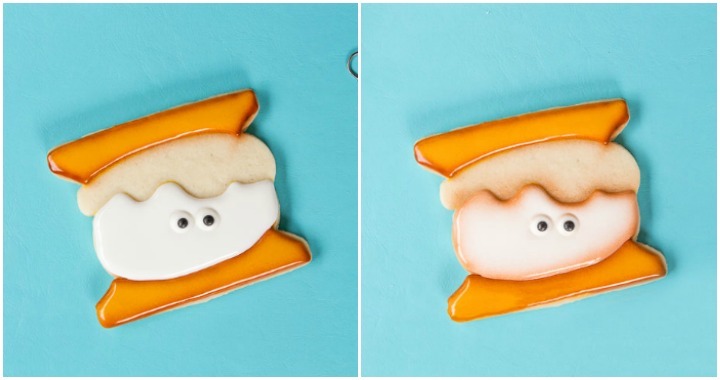 S’more Cookie Cutter by Mike at Semi Sweet. If you want to make the sticks, marshmallows, and graham crackers you can see what cutters I used below. Smore Color- I used Americolor and mixed Ivory, Lemon Yellow, and Chocolate Brown to make the s’more color I wanted. Candy Eyes I used the small template for these cookies. Make the eyes several days in advance. I usually make mine and store them in an airtight container away from the sunlight. Paint Brush- detailed for the eyebrows. 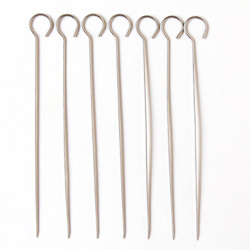 Toothpick or a BBQ Skewers to poke holes in the graham crackers. 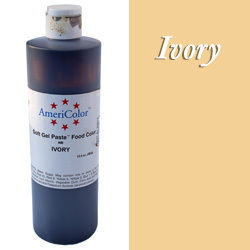 Airbrush System- The Cookie Countess or the Artfully Designed Airbrush System are the ones I use. There are other airbrush systems out there so use whatever works for you. 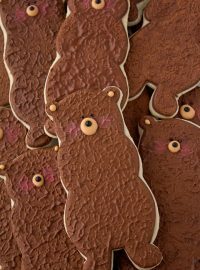 Don’t forget to go look at Mike’s How to Make Decorated S’mores Cookies at Semi Sweets. His cookies are so CUTE so what are we waiting for? Let’s do this! 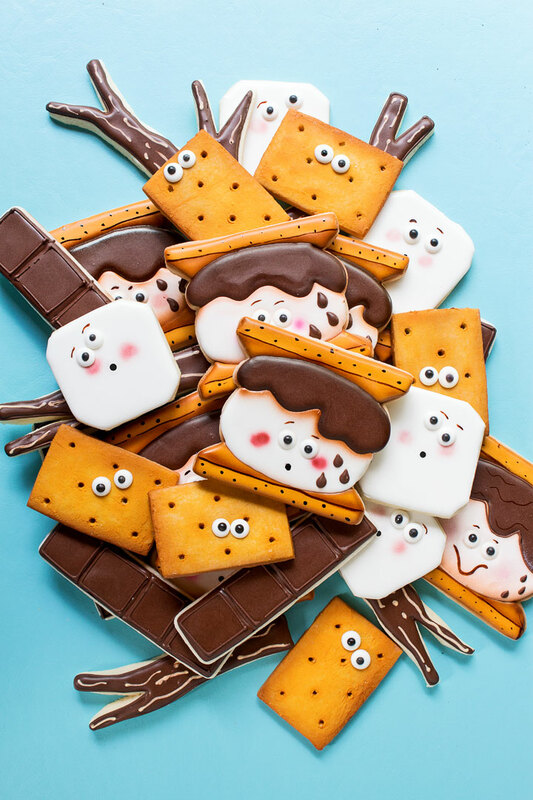 Before we get started, lay out the cutters you’re going to use for the graham crackers, marshmallows, and chocolate. It might do you a good to get a few sticks so you don’t burn your hand on the pretend fire. 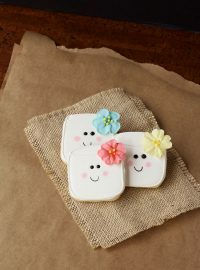 I used a rectangle cutter for the graham crackers, a square for the marshmallows and Sweet Sugarbelle’s stick cutter for the sticks and you can find it Flour Box Baker or you can find it at Country Kitchen Sweetart. 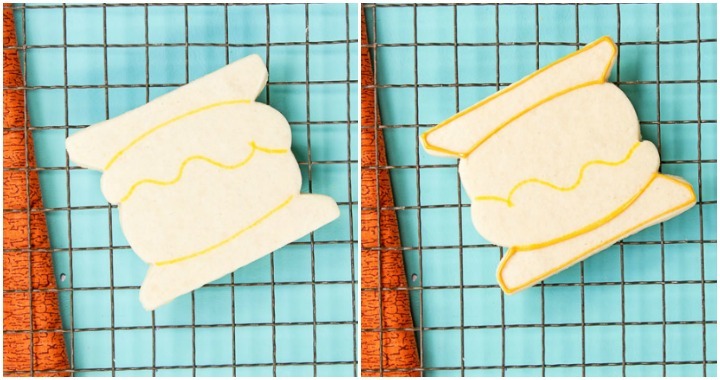 Trace the pattern you want to make on the s’more cookie. Outline the graham cracker at the top and bottom of the cookie and let it dry for about ten minutes. Flood the graham cracker and use the turkey lacer to pop any air bubbles. Let the royal icing dry for about thirty to forty-five minutes and then airbrush the edges. The airbrushing will give it a nice shadow which will give it a little character. Add the eyes while the royal icing is wet. Once the icing has dried, airbrush the top and sides of the marshmallow. As you can see in the picture at the top of this tutorial and at the bottom, I did it a couple of different ways. I only airbrushed the top on some and all around the edges on the other. Do whatever makes you feel comfortable. 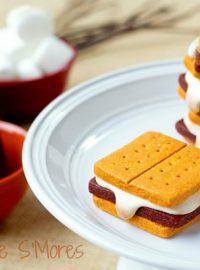 Spray the line on the top and bottom graham crackers. I used one of Sugarbell’s stick to help create the line I was trying to spray. Watch the video to see how to make it work. 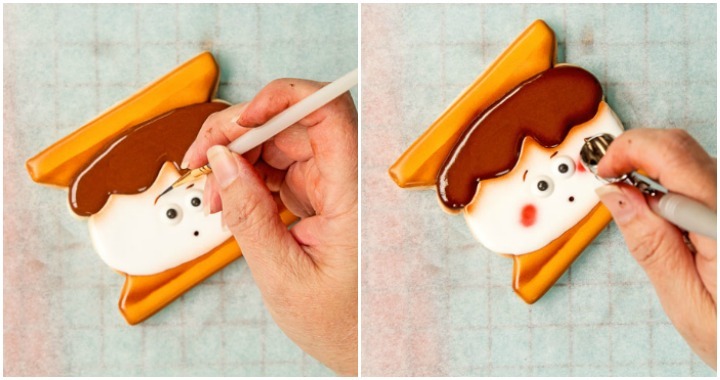 You can also use a piece of paper so you don’t mess up the cookie you’re working on. Next, flood the chocolate part of the s’more. Add three dots if want chocolate melting on the face. I think it’s cute! Paint the eyebrows above the eyes and use the wooden end of the paintbrush to make a circle mouth. Next, spray some preppy pink to the cheeks. Be careful because this stuff will come out fast and mess up your s’more. 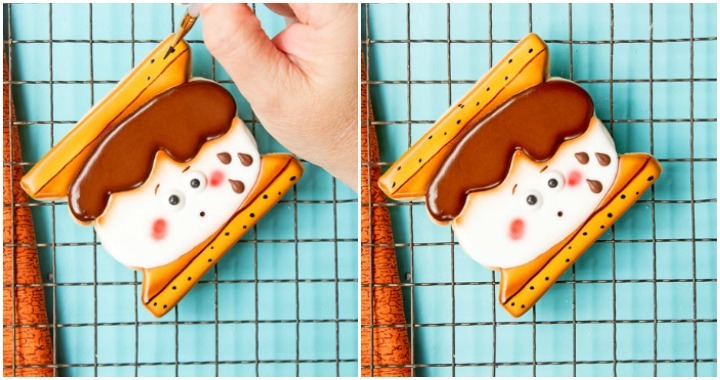 While the chocolate drips are drying, you can paint the lines and dots on the graham crackers. Paint one line across the top and one line across the bottom. Adding the dots is easy. 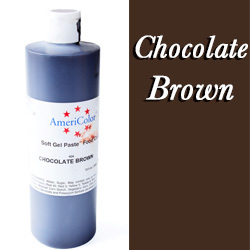 Just dip the paintbrush into the food gel color and dot it along the top and the bottom of the graham cracker. Let it dry completely before you package or stack them. See how I used the stick cookie to help make the top of the graham cracker? 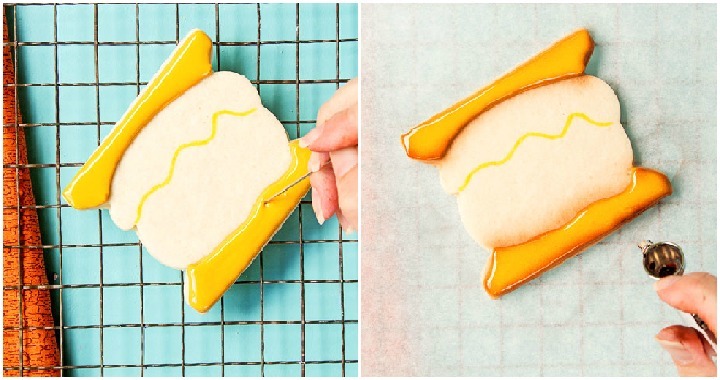 If you don’t have a stick cookie, all you need is something with a flat edge. Hold it over (or lay it on) the cookie and spray a line so it looks like the underside of the cookie. A little detail like this goes a long way. Now that you know how to make s’more cookies you need to make them. They’re adorable all your friends are going to love them. Be sure to tell Mike how much we all love his cookie cutters. I honestly can’t wait to see what he’s making and start shopping for the holidays! Your creativity and control with an airbrush is amazing. You always blow me away! Your attention to detail is amazing! I love your creativity! I do not have an airbrush and am sometimes tempted. Is it time consuming and a pain to clean it out? 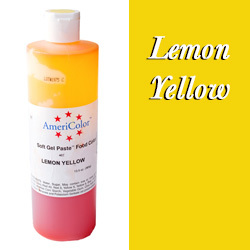 I use bottles with different size tips for outlining and flooding, and Wilton disposable bags with couplers and tips for my detail work. I am a glaze girl (10x sugar, milk, corn syrup) and royal icing for details. Do you use tipless bags for all your decorating?? Oh my goodness! These are the cutest little things ever! I just want to pinch those rosy cheeks. P.S. I wish I had mad cookie decorating skills like you. 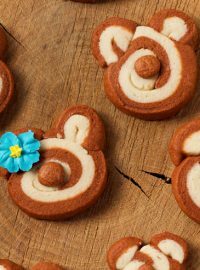 What cutter did you use for the cookie twigs? 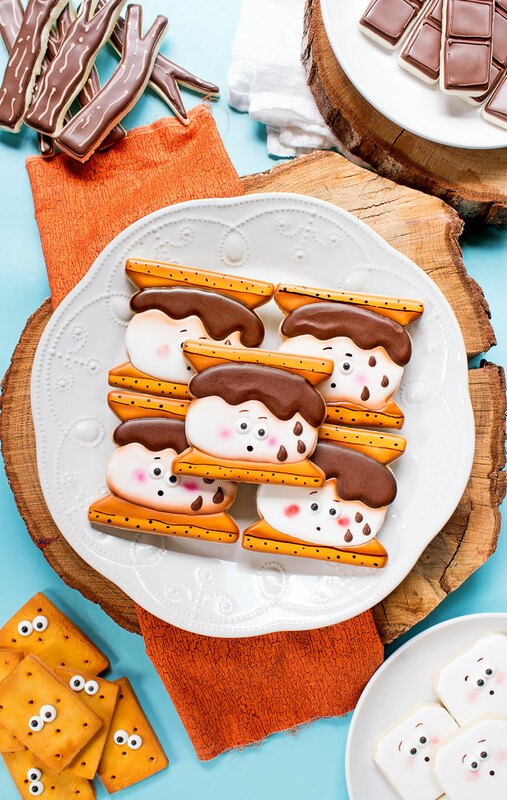 They are so cute to round out a s’more cookie set. 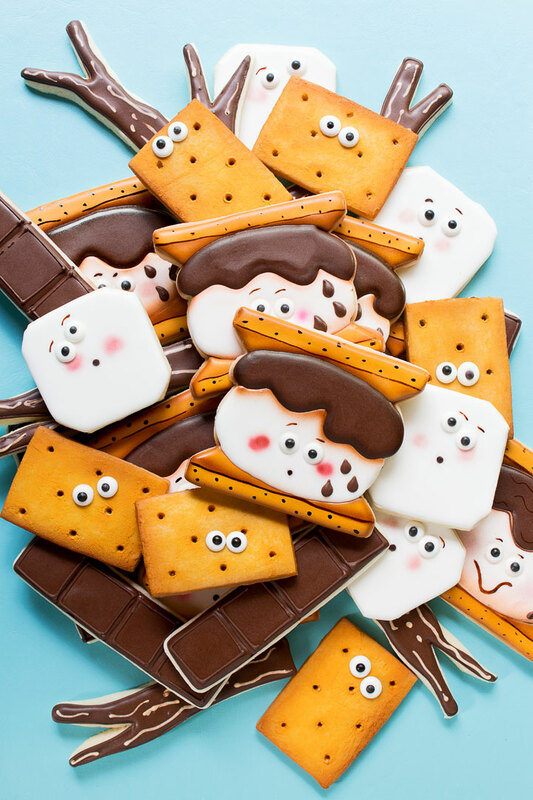 Your s’mores set is so cute, Lisa! Love their fun expressions!